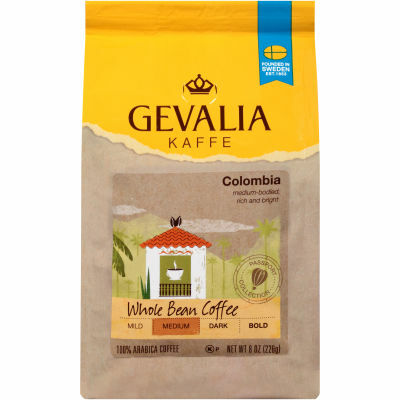 Gevalia Colombian Whole Beans Coffee - With its blend of whole beans chosen for their sparkling flavor, Gevalia Colombian coffee delivers rich, bright flavor you'll love. Well balanced and medium-bodied with a touch of winey acidity, this blend is a perfect choice for any occasion, any time of day. Delectable Taste Packaged for Freshness - Crafted from 100% Arabica beans, this blend produces a smooth, flavorful cup of coffee your taste buds will love. The beans come packaged in a sealed bag that maintains freshness, retaining their robust aroma and daring, flavorful taste.